"It can be such an original combination that it results in the formation of balls like these." A similar phenomenon was witnessed in the Gulf of Finland in December 2014, and on Lake Michigan in December 2015, the Ura.ru website said. 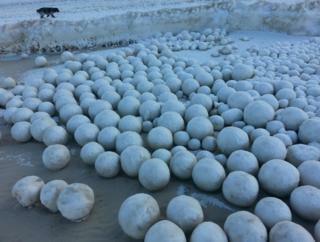 Pictures of the snowballs have charmed Russians online. A reader of the TJournal news site calling himself "Anton Antonov" joked: "Soon the peninsula will be invaded by hatched snowsaurs!"